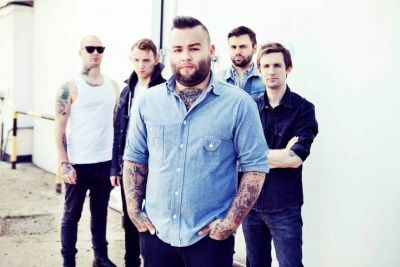 Festival favourites, Gallows return to Leeds Festival with new-ish recruit Wade MacNeil (formerly of Alexisonfire) and a new self-titled album due out in September. Wade and guitarist Laurent “Lags” Barnard sat down with Soundsphere to talk about the new record, their upcoming European tour and erm…zombies. S] Welcome to Leeds Festival! You happy to be back? Laurent “Lags” Barnard] “Yeah, it feels really good. I did Reading last year and missed out on Leeds so I was just hanging out and partying and Djing y’know! So, it’s good to be back in Leeds, yeah! S] Obviously fans will be aware of the recent line-up change within the band, what is it you’re looking forward to in the new era of Gallows? S] You’re playing the Dance/Lock-Up Stage tonight, how much of the set-list will incorporate material from the new self-titled album? S] So Wade, are you looking forward to your first time at Leeds and Reading with Gallows? WM] It’s actually my second time. I met “Lags” [Laurent Barnard] in a bar in London, I guess it was, 2006? S] Are there any bands you’d like to see over the Leeds and Reading weekend? S] After this summer’s festival season you got a European tour coming up. When that comes around, what are you looking forward to the most? S] In terms of places in Europe you’ll be visiting, is there anywhere you’re looking to seeing for the first time? S] Final question, if you were in a Zombie Apocalypse, what weapon would you use and why? LB] Chainsaw. I’ll go with that, it seems like the one to use against zombies, most people use it- it’s the go-to killing machine. You can just wave it around! For more information visit the official Gallows website.